Once they have shown themselves to you as geometric, shape-shifting, living interdimensional spacecraft in the sky, a few hundred feet overhead, you are absolutely finished. Finished in the world of status quo mainstream disbelievers. You have no choice but to join our band of counter-culture, spiritual eccentrics ~ to become a seeker... because the whole weight of existential reality will come crashing down upon your head, exploding all of your beliefs which are founded in, grounded in, and rooted in societal hypermaterialistic rationalism, and the one-dimensional tunnel vision of the ego-mind. Below is the best footage we've ever seen of a hyperdimensional being making itself appear as an ultra-advanced spacecraft within our physical, three-dimensional space/ time continuum. (notice how it constantly changes shape and dose not seem entirely solid or entirely in our physical dimension). "The Crucifixion" painted in 1350, from Visoki Decani, Kosovo, clearly depicts two UFO's. The UFO phenomenon is certainly nothing new. Depictions of UFO's with precisely the same shapes and design characteristics commonly witnessed in today's skies have been found in caves and archaeological excavations dating back over 10,000 years. Archaeologists have discovered sculptures, engravings, tapestries, fresco's, carvings, paintings, and cave drawings of aliens and sophisticated "flying vehicles" that stretch all the way back to the ancient prehistoric era. ​"The Crucifixion" 1350, This painting depicts two UFOs with Aliens inside, flying by Christ's Crucifixion in the top right and left corners of the painting. The obvious question is how could people from centuries or even eons ago have ever conceptualized, cogitated, or imagined ultra-advanced alien spacecraft rocketing through the skies, when the very idea of manned air-flight was thought of as ridicules - beyond the realm of possibility - until the late 1800's?... People of ancient times were not used to observing or conceptualizing anything more technologically or mechanically advanced than extremely crude weaponry, windmills, olive presses, etc...? There are at least an estimated 10,000 photographic cases of UFOs. Many of the photographs (including some of the largest collections) are held by several private researchers and organizations. One organization has compiled 5,000 UFO photographs and photographic cases; another UFO researcher has approximately 4,000. These collections are not currently fully accessible to the public. While many sightings described as UFOs turn out to be misidentified "known" natural and artificial phenomena, many hundreds do not. It is these that form the core of the UFO mystery. That UFOs constitute a distinct category of describable sights is based on hundreds of highly detailed and consistent descriptions by highly trained professionals (especially airline and military pilots) of close-up, broad daylight observations of unique flying machines. If a close look is taken at the best available evidence, it is possible to deal with what is known about UFOs, and what may reasonably be assumed. The point we will make is that the evidence supporting the conclusion that UFOs are unknown extraterrestrial interdimensional spacecraft seems to be overwhelming. • There are numerous daytime and night time photographs and videotapes of clearly non-human spacecraft from all over the world; these films and videotapes have been evaluated and deemed authentic by competent experts in optical physics and related fields. • There are more than 3500 military and commercial aircraft pilot reports of encounters worldwide; many cases have corroborating radar documentation and multiple witnesses both on the ground and in the air. • There are more than 4000 landing trace cases from around the world. • There are hundreds of electromagnetic cases where spacecraft have been observed by police, military personnel and civilians to affect car engines, radios and other electric devices. • There are more than 100 first- and second- hand witnesses to the retrieval of an extraterrestrial spacecraft and at least four extraterrestrial bodies from a crash which occurred in July, 1947, 75 miles northwest of Roswell, New Mexico; written and videotaped testimony from several first-hand witnesses who are respected military officers have been obtained. • There are hundreds of credible reports, many with multiple witnesses, of humanoids in association with landed spacecraft. • There are several multiple-witnessed events where humans have been taken on board spacecraft. • CSETI (The Center for the Study of Extraterrestrial Intelligence) has in the past 18 months succeeded in intentionally establishing contact with extraterrestrial spacecraft, on two occasions at very close range, and with multiple witnesses present. • Various polls have indicated that approximately 10% of Americans (25 million people) have seen them at close range so that details of the structure of the object can be discerned. • Numerous US. Government documents exist which indicate that these objects are real and have been involved with observing Earth for several decades. “The undeniable reality is that there are a substantial number of multi-sensor UFO cases backed by thousands of credible witnesses. In the physical domain there are many photos, videos, radar tracking, satellite sensor reports, landing traces including depressions and anomalous residual radiation, electromagnetic interference, and confirmed physiological effects. Personal observations have been made both day and night, often under excellent visibility with some at close range. Included are reports from multiple independent witnesses to the same event. The mental competence of many observers has been confirmed by Psychological testing. How could it possibly be that none of this is considered evidence? There are over 3000 cases reported by pilots, some of which include interference with flight controls. On numerous occasions air traffic controllers and other radar operators have noted unexplained objects on their scopes. So too have several astronomers and other competent scientists reported their personal observations. Many military officials from several dozen countries have confirmed multi-sensor observations of UFOs. The most senior air defense officers of Russia, Brazil, Belgium and recently a former Chief of Naval Operations in Chile all have stated that UFOs are real. These cases and comments are a minuscule fraction of the total body of evidence. “Abstract: Careful review of a vast array of relevant evidence clearly leads to the conclusion that some unidentified flying objects are intelligently controlled vehicles whose origin is outside of our solar system. All arguments against an extraterrestrial origin seem to be based upon false reasoning, misrepresentation of evidence, neglect of relevant information, ignorance of relevant technology, or pseudo sophisticated assumptions about alien appearance, motivation, or government secrecy…. The primary UFO evidence consists of UFO sighting reports, multi-witness close encounters, still and motion pictures, radar trackings, simultaneous radar-visual sightings, physical traces (environmental changes in dirt, vegetation, trees, etc.) produced by UFOs, abductions by aliens of Earthlings, and very likely (in hidden locations) crashed UFOs and preserved alien bodies. The worldwide origin of the various data collections indicate similar experiences occurring and being reported independently all over the planet. The overall quality and quantity of reports is far better than most people—especially open-minded skeptics and scientists and newspaper reporters—are aware…. Stanton Friedman, nuclear physicist and leading UFO researcher, author of several books and numerous articles on UFOs. “On the basis of an intensive study of the UFO problem, I believe that the extraterrestrial-origin hypothesis must now be given extremely serious scientific attention…. …After a year of scrutiny of highly unconventional phenomena credibly reported from all parts of this country and [I believe] from most of the entire world, I have been driven to consider possibilities that I'd ordinarily not give a moment's thought to in my own personal brand of orthodoxy. It is the UFO evidence that slowly forces the diligent UFO student to seriously consider the extraterrestrial hypothesis - evidence that I can only describe as extraordinary in its total nature…. All over the globe persons in all walks of life, representing a wide range of cultural and educational backgrounds, are reporting, often in the face of unpleasant ridicule, sightings of objects that appear to be completely real objects yet have characteristics that match nothing about which we have present knowledge…. It is the detailed, close-range sightings by persons whose reliability cannot be brought into serious question that carry great weight. Pacing of aircraft and buzzing of cars by UFO's go on rather steadily. These cases so strongly suggest something vaguely resembling surveillance or reconnaissance that the student of the problem is forced to weigh the possibility that the UFOs are probes of some type engaged in something we would loosely call observation or monitoring. There are many other categories of sightings suggesting the same tentative hypothesis. How can this be? There is, in my opinion, no sensible alternative to the utterly shocking hypothesis that UFO's are extraterrestrial probes. “I have been studying now for about 2 years, on a rather intensive basis, the UFO problem. I have interviewed several hundred witnesses in selected cases, and I am astonished at what I have found. If the extraterrestrial hypothesis is proved correct (and I emphasize that the present evidence only points in that direction but cannot be said to constitute irrefutable proof), then clearly UFO's will become a top-priority scientific problem. I believe you might agree that, even if there were a slight chance of the correctness of that hypothesis, the UFO situation would demand the most careful attention…. My own study of the UFO problem has convinced me that we must rapidly escalate serious scientific attention to this extraordinarily intriguing puzzle…. I believe that the scientific community has been seriously misinformed for twenty years about the potential importance of UFO's. “I believe that it is necessary to take into very serious account the assumption that these strange objects constitute some sort of extraterrestrial probes. Before I had undertaken a personal study of the problem, I was willing to grant credit to such an assumption. After one year of intensive study, I must still regard it only as an assumption, but I must stress that my research strongly pushes me to admit that this assumption is the only acceptable one as for now if one wants to account for the utterly amazing number of observations at low altitude and short distance which are now recorded in the whole world and which relate to objects that have the properties and appearance of machines. To the numerous serious investigators of the UFO problem, it appears conceivable that something in the nature of a global surveillance by UFO's has been underway in recent years. If this view is correct, then our present ignorance of the purpose and plan of such surveillance must be urgently replaced by maximal understanding of what is going on… The present ignorance, the present neglect and the present mocking remarks, all constitute regrettable features of our collective attitudes with regard to what can be, for all the people of the world, an affair of utter importance. During twenty years, there was a persisting and intriguing flood of reports, coming from countries located in all the parts of the world, relating to what we finally called unidentified flying objects (UFO's). In all these reports, whatever their geographical origin, the nature of the reported objects appears to be primarily similar. During the last twelve months spent, I pursued an intensive examination of the scientific aspects of the UFO problem, dealing with reports originating within the limits of the United States. After I interviewed the key witnesses to dozen important cases distributed over the whole 1947-1967 period; after having studied, with personal of the U.S. Air Force, official methods of investigation; and after having personally checked a great number of other sources of information, I concluded that, far from being a stupid problem, the problem of the UFO's is a problem of an extraordinary scientific interest. My own studies led me to reject the opinion according to which they are only natural atmospheric phenomena or misinterpreted astronomical phenomena; in this respect a number of official explanations are almost absurdly erroneous. It is not possible anymore to explain all these observations with assumptions calling upon the products of a technology of avant-garde or experimental secret craft, with assumptions of mystification, fraud or trickery, or with psychological assumptions. Each one of these assumptions intervenes indeed in a great number of cases, but there still remains an astonishing number of other reports, submitted by observers highly worthy of faith during the last two decades, which cannot receive such a satisfactory explanation. I believe that this vast residue of reports, which amounts now to hundreds ~ perhaps thousands of cases ~ requires the attention of the most preeminent scientists of the world. James McDonald, “Are UFOs Extraterrestrial Surveillance Craft?”.... talk given at American Institute of Aeronautics and Astronautics, 1968. “If there were even a slim possibility that the Earth were under extraterrestrial surveillance in any form, it would be a matter of the greatest scientific importance, warranting the most rigorous investigation. In fact, the evidence that seems to point to the conclusion that UFO's could be such devices is far from negligible; yet because of the history ~ the official and scientific response ~ to many earlier UFO reports we continue to see mainly neglect and ridicule on this intriguing question. After examining around a thousand UFO reports and directly interviewing several hundred witnesses in selected UFO cases of outstanding interest, and after weighing alternative hypotheses, I find myself driven steadily further toward the position that the extraterrestrial hypothesis is, of course, not original with me; it has been urged for many years by persons knowledgeable with respect to the UFO problem, who spoke from outside scientific circles. Our collective failure to examine scientific aspects of the UFO problem will, I fear, be held against the scientific community when the full dimensions of the UFO evidence come to be recognized. The type of UFO reports that are most intriguing, and point most directly to an extraterrestrial hypothesis, are close-range sightings of machine-like objects of unconventional nature and unconventional performance characteristics, seen at low altitudes, and sometimes even on the ground. The general public is entirely unaware of the large number of such reports that are coming from credible witnesses because ridicule and scoffing have made most witnesses reluctant to report openly such unusual incidents. When one starts searching for such cases, their numbers are quite astonishing. Also, such sightings appear to be occurring all over the globe. Dr. Margaret Mead, world-renowned anthropologist, "UFOs - Visitors from Outer Space?,"
”The evidence that there are objects which have been seen in our atmosphere, and even on Terra firma, that cannot be accounted for either as man-made objects or as any physical force or effect known to our scientists seems to be overwhelming. A very large number of sightings have been vouched for by persons whose credentials seem to me unimpeachable. It is striking that so many have been trained observers, such as police officers and airline or military pilots. Their observations have in many instances—though by no means a majority—been supported by technical means such as radar, or even more convincingly, by visible evidence of the condition of the observers.... it is difficult to credit that they have all been lying or hallucinating. ”If every UFO report could be convincingly credited to some conventional astronomical or atmospheric phenomenon, there would be no UFO mystery. 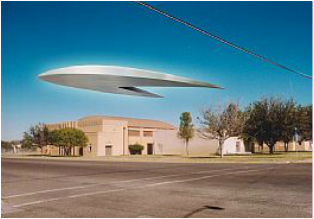 It is precisely because so many UFO reports cannot logically be blamed on stars, planets, satellites, airplanes, balloons, etc., that a UFO mystery has existed since at least the mid-1940s. The most convincing UFO reports were produced in the 1940's, 1950's and 1960's by airline pilots, military pilots and ex-military pilots. These men had the training and the experience to be able to distinguish between normal sky sights and highly abnormal sights. They knew what airplanes looked like, and what meteors looked like, having seen them many times. Their visual observations were frequently supported by radar data which showed essentially the same thing. They were, therefore, able, on many occasions, to methodically eliminate conventional phenomena from consideration when trying to identify UFOs. In those same decades, most UFO sightings were made in the daytime and frequently at close range, when shapes and surface features could be distinguished, making positive identification of normal sights easier and the descriptions of unusual sights more detailed. When all normal explanations had been eliminated, the witnesses could concentrate on those aspects of the experience which were most abnormal. These abnormal aspects included the shapes of UFOs and their behavior. Most of the UFOs seen in the daytime were said to have had simple geometric shapes ~ discs, ovals, spheres, cylinders, and surfaces that looked like metal. Such shapes are not only nonexistent among known aircraft, but contrary to all known theories of flight, in most cases offering control and performance disadvantages rather than advantages. At first glance, the idea that some UFOs may be vehicles from outside the Earth seems utterly preposterous, the baseless result of wishful thinking by highly unscientific minds. When authoritative reports of radical-design craft having spectacular performance are viewed in the light of a stream of astrobiological discoveries, the possibility that some UFOs are alien does not seem quite so farfetched. Serious-minded scientists in astronomy and other disciplines estimate there could be billions of planets in the universe, and millions that could harbor life. If even a few of those planets were occupied by technological civilizations, their ability (if not desire) to explore other worlds, such as ours, must be a possibility. Hundreds of thousands of UFO sightings have been made by persons in all walks of life, in all parts of the world. Tens of thousands of UFO reports have been made to governmental and private agencies in the past 55+ years. Thousands of these reports have withstood careful scrutiny and appear to represent real objects having a novel nature. Patterns of these UFOs' appearance and behavior suggest a limited range of sizes and shapes of unidentified craft, despite the often-desperate efforts on the part of the American and other governments to discount them as nothing more substantial than mistakes made by naive individuals. Their performance, observed repeatedly by expert witnesses, remains as far off the scale today as it was in the 1940's. 1) Millions of sightings worldwide and a hundred-thousand-plus sightings are on computer (UFOCAT). 2) 3,000-plus sightings from aircraft (Dr. Richard Haines). 3) 489 radar cases, many radar/visual (Dominique Weinstein); 363 radar cases, 76 as R/V (USAF records alone). 4) 5600 trace cases documented, 4104 involving UFO visual sightings (CUFOS). 6) Hundreds, if not thousands, of excellent close encounters by credible obswervers whose testimony in court would be taken at face value. "The definitive resolution of the UFO enigma will not come about unless and until the problem is subjected to open and extensive scientific study by the normal procedures of established science. “To judge from this survey of the membership of the American Astronomical Society, it appears that: (a) scientists have thoughts and views but no answers concerning the UFO problem; (b) Although there is no consensus, more scientists are of the opinion that the problem certainly or probably deserves scientific study than are of the opinion that it certainly or probably does not; (c) a small fraction (of order 5%) are likely to report varied and puzzling observations, not unlike so-called "UFO reports" made by the general public. As is the case with reports from the public, many may be unusual observations of familiar objects, but some seem to be definitely strange. These results are consistent with the findings of an earlier but more limited survey of members of the American Institute of Aeronautics and Astronautics (Sturrock, 1974). American Institute of Aeronautics and Astronautics UFO Subcommittee. …The fact that since 1946 numerous persons in all countries have made detailed reports of events they regard as strange, mysterious, sometimes even terrifying, deserves attention. While many of the reports can be traced to natural events, we intend to demonstrate that, after the inevitable errors and the obvious hoaxes are eliminated, the reports reveal common characterstics, possess a high degree of internal coherence, and appear to be the result of the witnesses’ exposure to a set of unusual circumstances. “The proponents [of UFOs] offer up impressive quantities of principally eyewitness data, which although largely subjective and circumstantial in nature, is nevertheless quite intriguing…. Many of the high-quality sighting reports involve certain objective aspects, which, to an open-minded bystander, are quite impressive. As a full-time, and serious-minded, UFO investigator, I strongly side with the proponents. It seems indisputable that the phenomenon is real, and that it falls outside the scope of “normal” human experience. “It has been my firm belief, based on my research and investigations over the past half century, that UFOs and their occupants, which I have named “UFOnauts,” are both real. These non-human occupants and their craft continue to be a part of an ever-growing global enigma. I have found there are real objects under in intelligent control being seen on the ground and in our skies worldwide. The unknowns have varied over the decades from 22 percent in my own civilian files, 30 percent in the University of Colorado Condon Committee scientific studies, to at least 40 percent (recently revised) found in the U.S. Air Force Project Blue Book military investigations. This is not acceptable, no matter who is doing the investigations. Richard Hall, veteran UFO researcher, author of “UFO Evidence” and other books. A contact with an extraterrestrial civilization is the greatest challenge for mankind in the Third Millennium. We would finally realize that we are indeed not alone, what could cause a new Copernican revolution, a quantum leap in our thinking and perspective. We would finally realize that we are one mankind and all the small differences which separate humans from each other today—nationality, race, religion—would disappear. Only together can mankind explore the universe, our true home and destiny. Morris Jessup, author of several pioneering books on the UFO phenomenon in the 1950's. Reliable people have been seeing the phenomenon known as flying saucers for a thousand years and more. There are good reports as far back as 1500 B.C. and before. Thousands of people have seen some kind of navigable contraptions in the sky, and some have sworn it under oath. “The most popular theory as to their identity and origin is the extraterrestrial hypothesis, and in view of the evidence currently available, it seems to be the most sensible. Individuals (generally scientists) who dismiss the UFO problem without examining the data are very remiss. One has only to see the distress and wonderment of a UFO witness to realize that something is afoot on this globe we call Earth. There are probably several races of intelligent beings in our galaxy alone who have solved the problem of propulsion which would make visitation to this planet very possible. Man does not like to accept this possibility, because his ego gets in the way of his reason. “On the basis of my offical research and investigation into UFO sightings and reports of alien contact, I am personally convinced that intelligent extraterrestrial are visiting Earth. I say this on the basis of the data available to me at the Ministry of Defense, both in terms of the historic records and the several hundred new cases that I investigated each year.